I'm tired of cooking. I'm tired of eating. I'm tired of holiday season! I don't like December. Holiday season always puts me in foul mood every year, without fail. The pressure of keeping up with holiday spirit is killing me. Like my normal daily life isn't hectic enough, the universe dictated that I need to make time to do tons of shopping, wrap about 50,000 present and wait in line for an hour at the post office to mail them out (I know, I boxed and pre-stamped, but my house sits on a hill with very steep driveway, the postman would not come up and pick up my boxes. And my 'lovely' local post office would not allow me to drop off the pre-stamped boxes. They need to be brought to the counter! Ha!). Top it all with secret Santas, remembering to give tips to the service guys, holiday baking, and some freakishly fast depleting money in my bank account. I'm done, man! January can't possible come soon enough for me. I mean, can't we just be nice to people all year long? Give gifts, cooking, baking, get together anytime we want? Why do we have to cram everything in one lousy month, trying to get things done before the deadline? I just want things back to normal. But for my family, especially my offsprings who clearly enjoy the season just like any child would, I grin and bear it. Just like any good person, I keep my coffee (sometimes vodka) induced sanity in place. At the end of the day, who am I to ruin their happiest and most exhilarating season of the year? Forget the fact that I can't stand the sight of eggnog in my fridge anymore, or the smell of pumpkin cinnamon ginger whatever spice that filled my house, I promise I'll be good and in my best behavior. Just give me whatever non-Christmas related food for dinner. Something simple, utterly comforting, but ultimately delicious. And if you're kind enough, please include some heavy alcoholic beverage with it. Rinse pork and pat dry with paper towel. Combine olive oil, chili powder, garlic, cumin, lime juice, salt and pepper in a small bowl. Mix to blend. Rub the spice mix all over the pork until completely covered. Heat a large skillet over medium heat. Add pork and brown on one side, about 5 minutes. Flip the pork over, and brown the other side. 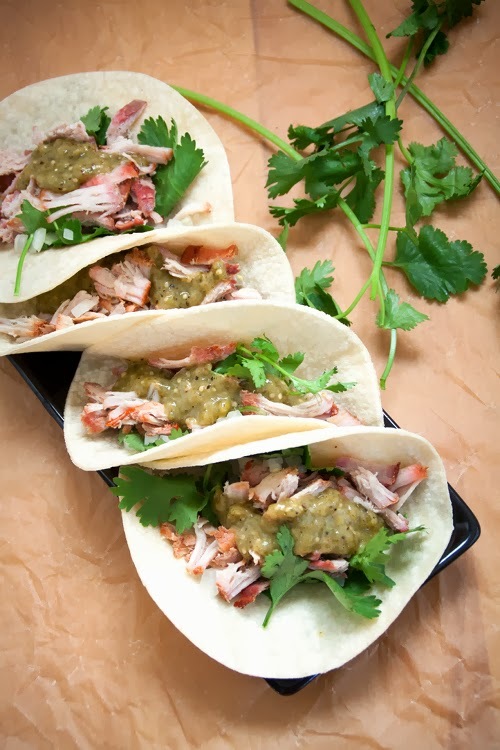 Remove pork from the skillet and transfer to a slow cooker. Cook pork in low setting for 6-8 hours. When the pork is done and tender, shred the meat using 2 forks. To serve, place corn tortilla in a hot pan over medium heat, flip over to heat the other side. 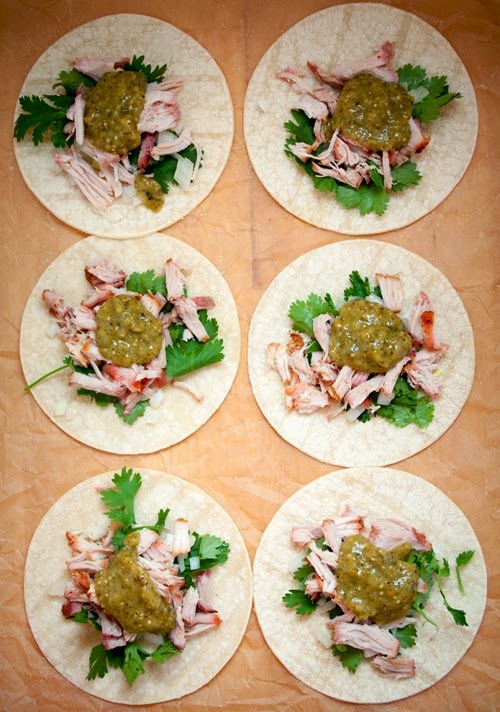 Place a teaspoon of chopped onion, chopped cilantro, and a heaping spoonful of shredded pork in the center of tortilla. Top with salsa verde. Serve with lime wedge and hot sauce, if desired. Move the oven rack to the top position, turn on the oven to broil. Place tomatillos, jalapeños, garlic and onion in a oven-safe dish. Broil in the oven for about 10-15 minutes, or until the vegetables are soft and nicely charred. Move and rotate the vegetables if necessary, to ensure that they're cooked evenly. Remove from the oven and let sit to cool down. Transfer tomatillos, garlic, onion, and peppers to a food processor. Add chicken stock, lime juice, and cilantro into the mix. Pulse 4-5 time until salsa turn smooth. Season with salt. i love to served this with steaks! btw, dapat tomatillos dimana mbak ??? tinggal diluar atau di indo mbak??? Merry christmas and happy holidays, God blessed you all the way then! 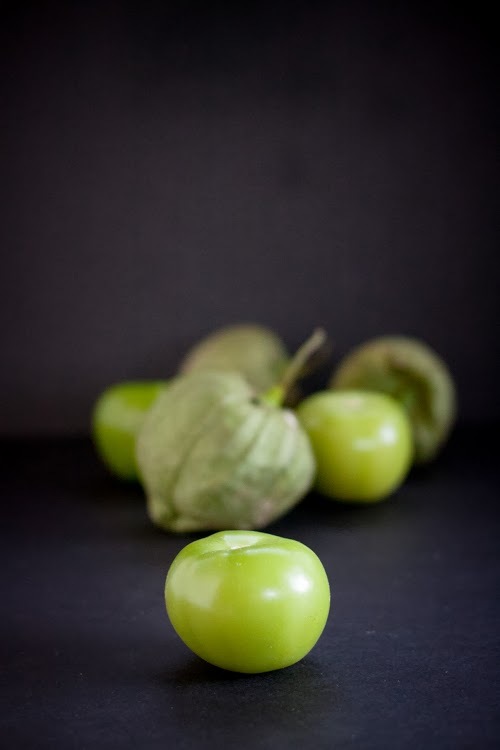 I live in California, so tomatillos are easy to find here. I don't know where to find them in Indonesia, but I'm wondering if you can try it with green tomatoes instead? 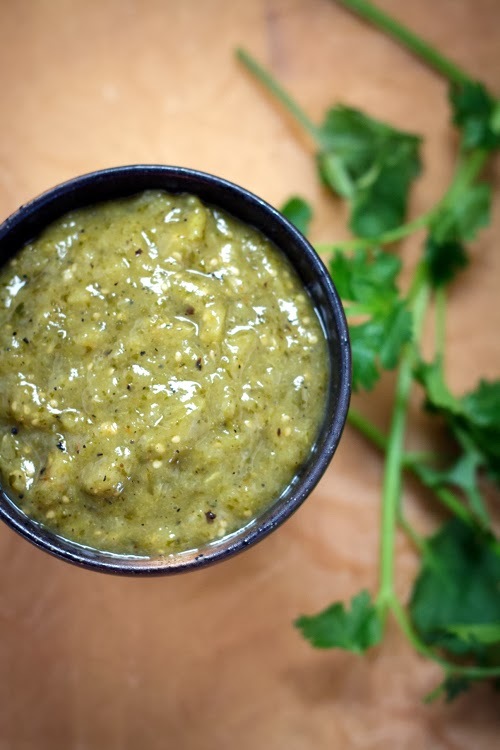 i once brought the canned salsa verde, it's got a specifif tangy hint and i really missed it, lucky you then! I was delighted to find this web site. I wanted to thank you for your time reading this wonderful! I really enjoyed every bit of it and I've marked to ensure that the blog post something new. Bus back panel advertising in Visakhapatnam gave by the organization incorporates the arrangement of ads showed on the back side of buses, through the method for strip commercial.